Most of what weâ€™ve talked about thus far has been design theory. Theoryâ€™s helpful, but it can only take us so far towards understanding why some ideas workâ€”and others donâ€™tâ€”in a websiteâ€™s design. In my opinion, examples and practice are much more valuable. Most academic graphic design programs include a curriculum thatâ€™s rich in art history and fine art. These classes provide a great foundation for an understanding of graphic design from an art perspective, but they do little to prepare you for the specific challenges you encounter when you take your designs to the Web. Pablo Picasso once said, â€œI am always doing that which I cannot do, in order that I may learn how to do it.â€� While I like to take that approach when designing a new website, itâ€™s important first to know what you can do. When you look out across the Internet, you can see that the possibilities for layout are endless. Depending on the goals of the site, though, only a few of those possibilities make good design sense. Thatâ€™s why we see certain configurations of identity, navigation, and content over and over again. In this section, weâ€™ll talk about the three most common layouts, and explore some of their advantages and disadvantages. Regardless of whether weâ€™re talking about liquid or fixed-width layout design, the left-column navigation format is a time-honored standard. 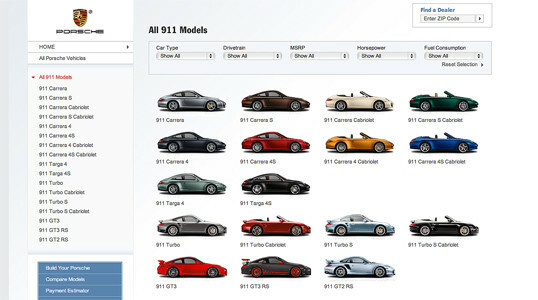 The layout of the Porsche site, pictured just below, is a classic example of this configuration. 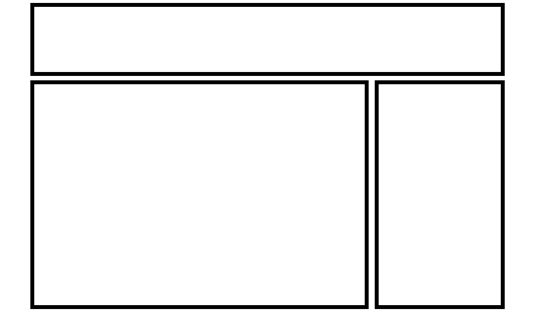 Many sites that fit into this mold donâ€™t necessarily use the left column as the main navigation blockâ€”sometimes youâ€™ll see the navigation along the top of the pageâ€”but they still divide the layout below the header into a narrow (one-third or less) left column and a wide right column. Itâ€™s like a security blanket, or that comfortable shirt with holes in the armpits that you wear once a weekâ€”even though it drives your spouse crazy. 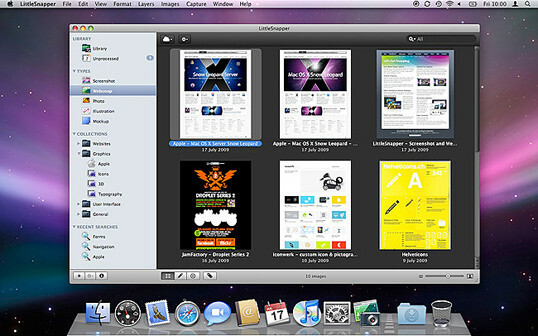 For those reasons, a layout featuring left-column navigation is a safe choice for most projects. The downside to sites that use left-column navigation is that they can appear to lack creativity. Itâ€™s been done so many times, in so many ways, over so many years that they tend to look the same. 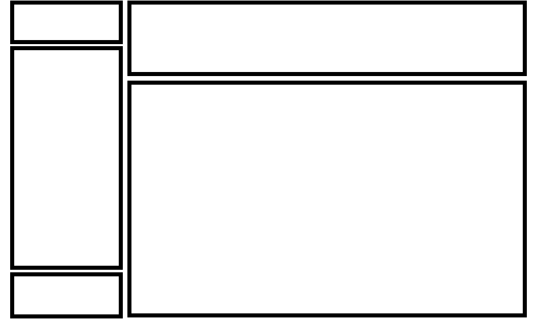 Thatâ€™s not to say you should avoid using a left-column navigation layout. 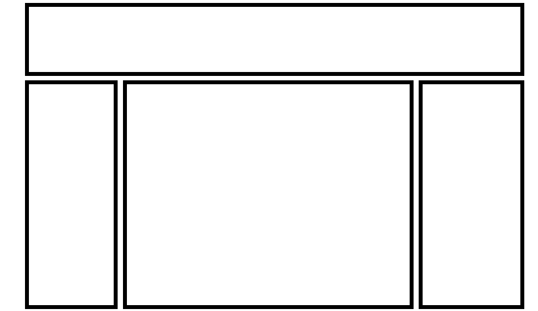 At a guess, Iâ€™d say that 75% of the sites Iâ€™ve designed have a secondary left-column navigation, but I do try to mix it up a little when I can. Speaking of mixing it up, how about picking that left column up and sticking it on the other side of the content? Then youâ€™d have a right-column navigation layout. If youâ€™re going to restrict your main content to one side of the page, itâ€™s more widespread these days to push it to the left, placing navigation, advertising, and subsidiary content on the right. This is an especially common configuration for news sites, social networks, and websites with expansive navigation schemes that are unable to be contained within a simple top navigation. 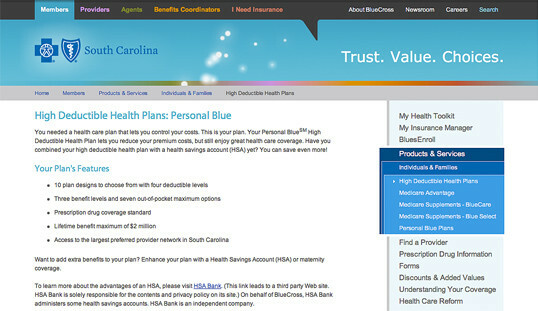 BlueCross BlueShield of South Carolina is an example of such a site. It features several different layouts and color schemes for each section. The screenshot below is a fourth-level pageâ€”that is, itâ€™s four clicks away from the front page. By keeping the secondary navigation on the right, it stays out of the way of visitors who, if theyâ€™re this deep already, are looking for some very specific content. Ultimately, the decision on whether to put a navigation column on the left or the right is a judgment call thatâ€™s really about the amount and type of content you have to organize. If itâ€™s a simple site that doesnâ€™t require any secondary navigation, consider a narrow, column-less layout. Good design is often more about what you leave out than what you put in. If you do need a secondary column, just remember that the content is what your visitors are there for â€¦ and more and more, theyâ€™re looking for it on the left. The typical three-column layout has a wide center column flanked by two diminutive navigational columns. 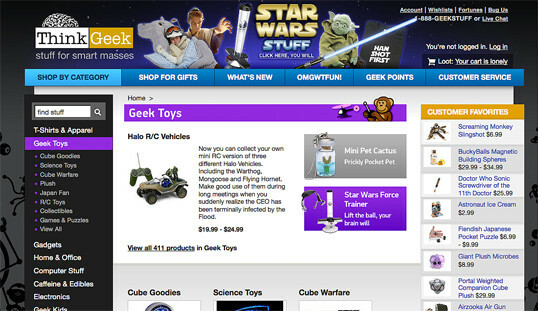 The ThinkGeek store is an example of this web page layout staple. Although three columns may be necessary on pages that have a ton of navigation, short bits of content, or advertising to display, whitespace is essential if weâ€™re to keep a layout from appearing cluttered. There are a ton of great CSS galleries out there. Unmatched Style is more selective than others, and the video podcasts and interviews are usually interesting as well. Like Unmatched Style, CSS Drive is a CSS gallery. What makes this one special is that they do a good job of categorizing featured sites by color schemes and layout. From 2005-2009, Patrick McNeil collected and cataloged thousands of interested web designs. He has published two books, and the Design Meltdown site continues to be a great source of inspiration. Unlike the first three examples, Pattern Tap is a gallery of interface patterns rather than entire websites. Here youâ€™ll find collections of navigation styles, contact forms, pagination, tabs, and more. Similar to Pattern Tap, but with far fewer examples and variations, the Yahoo Design Pattern Library is a great place to learn about standard user interface elements. I know what youâ€™re thinking: â€œGreat, I have a bunch of galleries and pattern libraries to look atâ€”now what?â€� One of the most useful tips my first graphic design professor taught me was to create a morgue file whenever I was collecting inspiration for a large project. The concept is fairly simple: if youâ€™re doing an illustration or marketing project that involves trains, you clip out and print up anything you can find that might give you inspiration and keep it all in a folder. It helps with your current project, and should you ever need to do another project involving trains, youâ€™ll have lots of inspiration on hand. The morgue file idea slipped my mind until a few years ago. I found myself looking for a site Iâ€™d seen in a gallery site that I liked, but of which I was unable to remember the name or address. Sure itâ€™s great to have access to lots of great inspiration resources, but they useless if you canâ€™t find the specific example youâ€™re looking for. That was when I started my own digital morgue file. Lately, Iâ€™ve been using an application called LittleSnapper for Mac that allows me to create a screenshot of part of the screen, or even a whole web page (no more scroll, snap, scroll, snap). LittleSnapper also lets you give each snapshot a name, and tags to make them easy to find later. Of course, no matter what operating system you prefer, there are plenty of ways to take a snapshot for your morgue file. Having a repository of website designs that I can look at has been a handy resource on countless occasions when Iâ€™ve been searching for inspiration. Select the browser window thatâ€™s displaying the page you wish to save as a screenshot. Copy a screenshot of the browser window to your clipboard â€” on a PC: press Alt + Print Screen or use the native Snipping Tool (Windows Vista or 7) to grab a section of the screen; on a Mac: press Shift + Command + 4, then Space to turn the cursor into a camera. Then, hold down Control, and click on the browser window. At this point, you should have a screenshot of the browser window in your clipboard. Open a new document in your favorite graphics program or document editor, and paste in the screenshot. Save your image or document. Next up weâ€™ll look at some new design trends. This article is from Jason Beaird’s The Principles of Beautiful Web Design book (the second edition of which is out now). This is the eighth and ninth part of the first chapter.